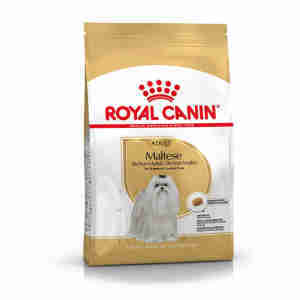 Royal Canin Maltese adult food is designed to meet the nutritional needs of this special breed. If your Maltese dog’s coat is looking less shiny or you notice them scratching more and losing fur, it might be a sign that your pet isn't getting everything they need from their diet. This kibble has a flavour they won’t be able to resist and is packed full of good stuff that will care for their coat. It’s important that your pet gets the right amount of food for their age and weight. Always check the feeding guidelines before switching your pet’s food and monitor their reaction. If they seem to be putting on weight, lower their feeding amount slightly. It’s recommended that you introduce a new pet food gradually before switching completely. This dog food has been made with the help of vets. It’s designed to meet the unique needs of Maltese dogs and is ideal for those aged over ten months. Packed full of good stuff, it helps keep them in the peak of health. Omega acids take care of their coat, while biotin helps to maintain their claws and borage oil their adrenal health. This kibble also contains calcium chelators, which make it easier for your pet to absorb calcium. Calcium is super-important so that your dog can maintain strong bones. It's also key to good dental health, which can become a problem in older age. maize, rice, dehydrated poultry protein, animal fats, dehydrated pork protein, hydrolysed animal proteins, vegetable protein isolate*, maize flour, chicory pulp, soya oil, minerals, fish oil, yeasts, fructo-oligo-saccharides,borage oil (0.1%), marigold extract (source of lutein), green tea and grape extracts(source of polyphenols), hydrolysed crustaceans (source of glucosamine),hydrolysed cartilage (source of chondroitin). Analytical constituents: Protein: 24% - Fat content: 18% - Crude ash: 5.5% - Crude fibres: 1.4% - Per kg: Omega 6 fatty acids: 39.6 g - Omega 3 fatty acids: 7.2 g including EPA & DHA: 3 g. *L.I.P. : protein selected for its very high assimilation. We remind you of the necessity of watching your dog's body condition, and regular visits to your veterinary. Best food for my Maltese, they love it. Just wish it came in bigger sized bags. I find this is good for their coats and helps to keep weight on them, plus they love it. My Maltese can be fussy but she loves this food. She also tries to avoid chewing her food, but this one does encourage her to chew as promised on the packet. I have 6 Maltese and they all love this. By far their favourite out of this range so far.